Whyalla Holiday & Worker Accommodation was developed into operation in 2011 in response to an identified demand for ‘home away from home’ accommodation. 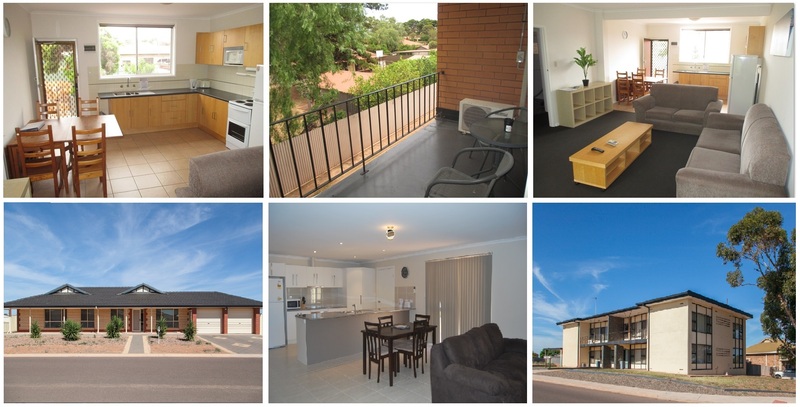 With ongoing projects in Whyalla and surrounds including the various projects undertaken at Iron Duke, Iron Baron and Cultana our properties offer a ‘home away from home’ for working persons or crews at an affordable rate. Our properties also serve as a fantastic option for Holiday accommodation with our units located in close proximity to the Whyalla Foreshore. Available to our clientele we offer ten two bedroom units and over 20 homes, ranging from two to four bedrooms. All units and houses are fully furnished unless otherwise stated. All houses are connected to utilities, and facilities and packages are tailored to be appropriate for a wide range of client needs. Open: Monday to Friday 10am – 12pm and 12:30pm to 3pm. After hours appointments available on arrangement. Negotiation of booking period is minimum of two weeks, subject to demand at the time of booking. In most cases a bond is not required. We require a purchase order or company/personal credit card number to be supplied. In most cases billing is via credit card, invoiced and paid weekly in advance. The Gwynne Residential Property Trust accepts company purchase orders, payment terms are a 14 day account. Weekly cleaning and linen changes can be organised on your behalf at an additional cost. With prior notification we can cater for crew-changes, night-shift servicing, weekly, fortnightly or monthly cleaning arrangements. Our properties are all fully furnished but we are able to accommodate for relocation of personal and provision of own furnishings pending availability and requested booking period. The supply of utilities are generally included in the rate of rental. For further information on utilities and the utility cap please contact The Gwynne Residential Property Trust. We will supply all maintenance and repairs to our corporate rental properties. This service is inclusive and at no additional cost in normal circumstances.